Rock carving at Sapodilla Bay Hill, Providenciales. Theft and vandalism have left very little of the original rock carvings. If you are in the area visiting Chalk Sound, Sapodilla Bay or Taylor Bay, it’s worth the hike to the top of the hill for the views. To the north, Sapodilla Hill overlooks Sapodilla Bay and Chalk Sound. 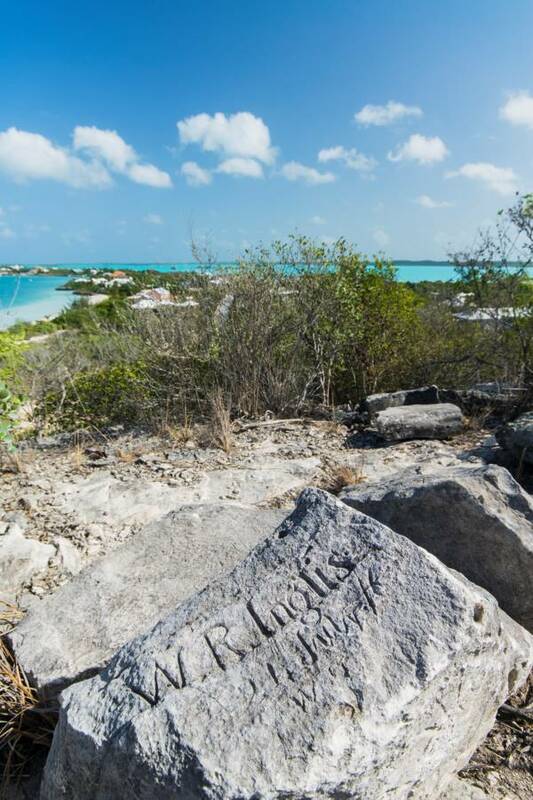 Located on a small bluff on the south coast of Providenciales, the rock carvings at Sapodilla Hill represent bygone sentiments left by shipwrecked sailors and travellers as they waited for their ships. The inscriptions found here include names, dates, symbols and simple depictions of ships and buildings. The age of these carvings range from the mid-1700s and well into the 1800s. Due to theft and vandalism, and some stones having been removed in 2010 during a preservation project. Unfortunately, there’s not much left to see of the carvings. The area is still worth a visit though; as there are excellent views from the top of Sapodilla Hill. If you didn’t get to visit the carvings, replicas of some of the more impressive stones are on display near the international departures security area at the Providenciales International Airport (PLS). The Sapodilla Bay Hill Rock Carvings are a protected historical site. It is illegal to steal, damage, or add graffiti to any rock in the area. The creation of rock balancing stacks is considered to be disturbing the natural features and is prohibited. Violators will face fines and criminal prosecution. Please do not step or walk on the inscriptions. The carvings depict messages left by travellers from past centuries. The elevations at Sapodilla Hill offers spectacular and fascinating scenery in all directions. 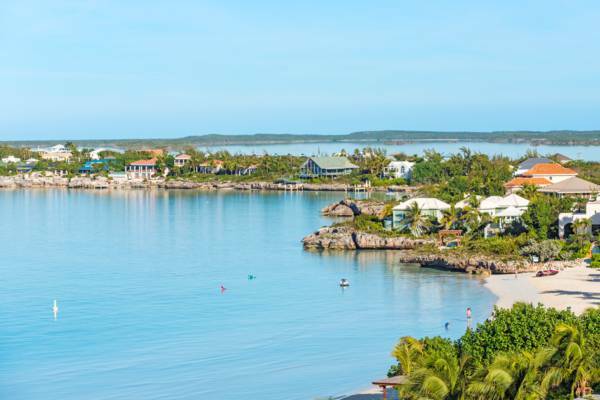 You’ll get birds-eye view of the brilliantly-turquoise Chalk Sound Lagoon, the calm Sapodilla Bay Beach, beautiful villas and mansions, and South Dock, the primary cargo port in the Turks and Caicos. The summit of Sapodilla Hill only reaches a little over 50 feet (15m), yet the path is poor, with loose and slippery rocks, so observe caution when climbing. Unlike the eastern islands in the Turks and Caicos that got their start with the sea salt industry in the late 1600s, the relatively fertile Caicos Islands largely began to experience settlement with the arrival of the Loyalists at the end of the American War of Independence a century later. The view from Sapodilla Bay Hill. The Loyalists typically pursued agriculture and planting in the American Colonies, and they attempted to do the same in the Turks and Caicos raising Sea Island Cotton, a variety of cotton introduced to this archipelago by the Taino aborigines. The small and sheltered cove at South Dock, formerly known as Gussy Cove, was a natural site for a port, and was utilized as such from the early days of settlement, when Cheshire Hall Plantation and the other plantations on Providenciales were in operation. As Sapodilla Hill was at the site of what functioned as an active port, the inscriptions were largely created by the crews as they awaited new tasks or voyages. 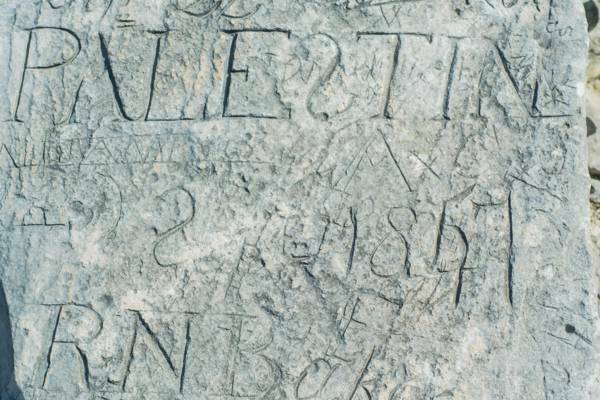 The rock inscriptions at West Harbour Bluff and elsewhere in the country, however, were often carved by shipwrecked sailors. Government and insurance records made at the time for vessels from the United Kingdom, Europe and America were often quite comprehensive, and some of the vessel names featured in the inscriptions in the country match preserved documents, including several ships that were lost at sea.